Archaeologist reveals ancient mosaic floor on Dome of Rock from Second Temple days damaged to degree as yet unknown. Archaeologist Dr. Gabi Barkay, director of the Temple Mount Sifting Project, told Arutz Sheva on Tuesday that the extent of the damage inflicted to the ancient mosaic floor of the Dome of the Rock on the Temple Mount may never be known. "The rugs that were donated by Abdullah the King of Jordan have already been attached to the floor, there is no documentation of the floor under the rugs - I was there and they didn't let me in," Barkay said. "The information we know is only from videos spread on the internet by Islamic sources." According to the archaeologist, the ancient floor is located above historical sites of the highest importance, aside from being located on the Temple Mount, the holiest site in Judaism. "A portion of the floor is in halls surrounding the building since the Crusader Period, the other portion is in a more ancient cave, perhaps from 3,000 years BCE, and part of it is likely to be from the days of the Second Temple," said Barkay. Describing the ancient mosaic floors, he said, "on one of the flooring tiles in the shape of a hexagon, when you tap it there's an empty space (below it); this is described in ancient sources as the 'well of spirits,' a place where there are the spirits of tzadikim (righteous people - ed.)." The archaeologist said that Israel must not allow the Jordanian Waqf to destroy ancient Jewish artifacts - his project sifting through detritus from the Temple Mount involves trying to find Jewish relics that the Waqf has destroyed and putting the pieces back together. 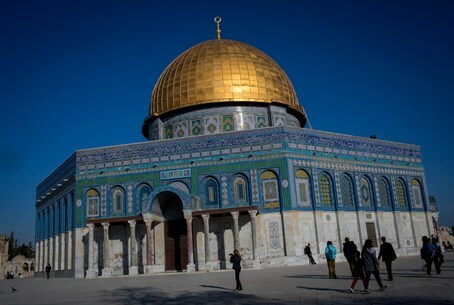 "The Dome of the Rock is a building that has stood since 691 CE, it's a building that stands on the site of the Jewish Temple and that must be said, even if there are ideological differences," said Barkay. He continued, "in the past there were barbaric acts and brutal destruction with bulldozers, these are part of the acts of the Islam that wants to eliminate signs of other religions." "We need to be strict about having constant surveillance, and it turns out that the committee to prevent the destruction of antiquities on the Temple Mount, of which I am a member, is very necessary still today. It's true that there's better surveillance of the Israel police, but a more constant surveillance is needed," said Barkay.